Square pegs in round holes is a phrase used to indicate people who are misfits in their jobs. Such ones are commonly found in large numbers now. These days everyone carries on the business of his or her own liking. Even the natural elements will change. This writ of changing times has affected the numbers, letters, the humans represented by them and all their activities including education and employment. No doubt, we find a lot of misfits in each field. Some of them whose numerological factors are favourable have a high degree of adaptability and they flourish; all others perish. Of course, Numerology can come to their rescue and the book “My Fortune” can serve as a friend, philosopher and guide to those unfortunate souls! First of all, find out whether the Name Number of a child is in harmony with the Numbers of date birth. If, as per the Birth or Destiny Numbers, the child has an aptitude or skill in a particular field, then choose a Name Number that is lucky and suitable. This helps the child to pursue successfully that particular branch of study which suits him or her. When the child grows up, all the things relating to employment will easily fall into the slot, because the Numbers are there to take care! As regards grown-ups who find their jobs or business boring or unprofitable or involving dangers, it is never too late to remedy the fault in their numbers, so long as the persons are in their formative or productive cycle of life. You must remember that education or honing up a skill is like cultivation of a crop and employment or running a business is the harvest. Numerology as a whole and “My Fortune” in particular, consists of time-tested principles which provide new vistas of hope and can transform the lives of suffering souls. Let me discuss a couple of cases of numerological interest, one distinctly different from the other, which may enlighten you more. Dr. Verghese Kurien, born on a date under Number 8, had an engineering degree from Michigan University in USA. Destiny gave him a job after his return to India, which was insipid to him and had no relation to his engineering aptitude. He was appointed as the Director of National Dairy Development Board in Gujarat. Everyone knows that he “fitted” too well in his assignment and was later praised as “The Father of White Revolution” in India, because his efforts ensured milk supply even to the remotest area of the country. It is learnt that this Number 8 personality chose to take up this job on the 31st August 1949. The “might” of Eight helps people too, if it is properly understood and used! Born under Numbers 1 & 4, a Harvard drop-out arrested by cops in 1977 for rash driving was considered a “problem child”! Who could ever have predicted that the same boy would become the richest person in the world in the 31st year of his age? Guess who?… it is none other than Bill Gates, who founded the computer giant MICROSOFT! But, Destiny’s warning about the fateful numbers was not heeded in the case of Syed Mehedi (Name Number 37). He changed his name to SYed Modi (Name Number 29) which spelt his doom! The young sportsman of India who had a promising future left his job because he preferred to become a full-time professional sportsman, had a difference of opinion with his wife over his decisions and died prematurely under tragic circumstances, the cause of which is still not clearly known. Oscar Wilde may be a famous name in the literary circles of the English-speaking world, but the Name Number that totalled to an 8 was not lucky to this Irish writer born under Number 7. Fingel O’ Flaherite Wills, as he was originally known, suffered untold miseries ostracized by the society and in his career, and finally in his 44th year of age committed suicide. It is a pity that he was warned by a famous occultist of his time many years before this tragic death! The abovecited examples are only a few to prove that numbers can either do or undo one’s life. Any defect or deficiency in education or employment can be rectified by a Numerologist who knows thoroughly the magic and logic of numbers and well-versed in Astrology, Palmistry and other fields of predictive sciences. Pandit Sethuraman was one such professional with rare wisdom and uncanny ability to peep into his clients’ future. His monumental work in Tamil entitled “Adhishta Vingyanam” first published in 1954 is the bestseller even today. 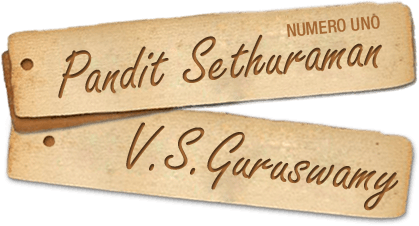 His worthy son Mr. V.S.Guruswamy, himself a famous professional numerologist for more than 20 years, not only continues to publish the Tamil editions from 1997 (after his father’s demise) but also has published the English, Hindi, Telugu and Chinese versions in the year 2003! “My fortune” by Mr. V.S. Guruswamy is now on I-Book, only to help you invoke Goddess Luck! It is the only treatise in the world that expounds the relation between your birth and destiny numbers in the most lucid manner! Mahatma Gandhi was a qualified barrister and he did pursue the legal profession for a couple of years. But did he continue…? No! He just felt that merely arguing in the courts was not his calling. His name number of 25 did not go very well with his birth and destiny numbers (2 & 9). His education, erudition and experience and above all, his own life was sacrificed only for liberating India from British rule. What more, he used for his cause an unusual and invisible weapon-Non-Violence! That is how his peculiar numbers shaped his destiny! Cardinal Gieuseppe Messofanti (1774-1849) of Bologna (Italy) had his birth and destiny numbers as 8 and 9, both denoting hard work, austerity and unusual intelligence on the positive side. Though poor and uneducated, he had an abnormal memory and grasping power using which he mastered 58 languages! (His biographer Headley even went to the extent of concluding that this extra-ordinary or super-human power was acquired by the cardinal because a “deity” helped him!) His name number 61 (based on his commonly known name, Cardinal Messofanti) provides the clue (with respect to his birth and destiny numbers) that such people hardly need any formal education and just by self-education they could become unusually famous all over the world. True, his record is unbroken till date and this magic was possible due to his numbers! Guru Nanak is one of the best examples of a great philosopher-saint revered by India who proved to the world that even without any reckonable formal education, one can realize God just by contemplation and meditation. He was born into a family of agriculturists but he was rather interested in relieving the masses of the burden of their superstitions, obscurantist views and false pride that comes sometimes with high education. This teacher of a new religion, Sikhism, reformed the society and gave it courage, pride morality and charity. His was a divine life admired by people of other religions also and his teachings purified the human minds. His personality was magnetic and his life was a great lesson to mankind synonymous with his birth and destiny numbers. This is a unique case of numerological miracle!